The most deplorable bridge accident in the history of Darjeeling that took place at Bijanbari on 22Nd of October 2011 snatched the the happiness of several families of the valley .The final report says that 33 people died and 160 people were injured including fully and partially injured . Several financial aids were announced by the Bengal Government and and amount of Rs. one lakh was announced by the Sikkim Government for those who lost their family member.A temporary wooden bridge locally named as Fadkay has been made for communication unless the proper bridge will not be constructed. 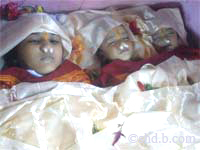 The dead bodies of small child shown in the figure are the three daughters of Mr.Manoj Ghimiray a resident of Chainpuray Bijanbari.From the left Nishan Ghimiray 2yrs , Nisha Ghimiray 2yrs , Niruta Ghimiray 10 yrs. Died at Planters’ Hospital, Dj.